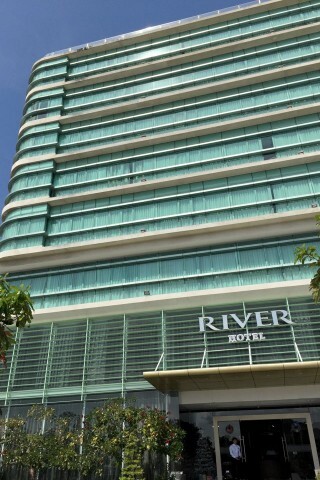 River Hotel is a sleek find for a border town and it’s the largest hotel in Ha Tien. Average rating 7.9 from 377 reviews. Shaped like a cruise ship and set at the edge of the Dong Ho river, you get pleasant river views from the rooms along with all the modern amenities such as flatscreen TV, WiFi, air-con, minibar, kettle, electronic safe, desk and plush arm chairs. Crisp white walls and beige accents make the modestly sized room light and bright, while the full windows allow a gorgeous amount of sunlight in. The bed is also wonderfully comfortable. The bathroom has a shower with good water pressure but it never gets hotter than lukewarm. The fluffy white towels and extra bright lighting make up for it though. Reception staff speak English which is helpful, especially if this is your very first stop in Vietnam. There’s also an outdoor swimming pool. The buffet breakfast has both Vietnamese and some Western fare and it will satisfy most since it’s included in the rate. In the evening the hotel sets up a casual cafe on the riverside footpath across from the building. Whether you stay here or not, it’s an excellent spot to sit in a lawn chair, have a sundowner and take in the ambience. This is the most comfortable and upscale option in Ha Tien. It’s located directly across the river from the pier. Like all riverfront hotels in Ha Tien, expect a jolting early morning wakeup call from the ferry blowing the departure horn. Check rates at River Hotel on Booking.com. Where are you planning on heading to after Ha Tien? Here are some spots commonly visited from here, or click here to see a full destination list for Vietnam.